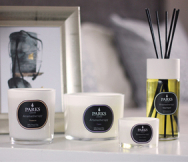 The perfect gift for someone special, Parks’ Mother’s Day gift range lets you say it with scent when a bouquet just won’t do. We’ve curated a range of luxury home candle gifts that we think your mum will love – for a personal and thoughtful present this Mother’s Day. Four of our most popular fragrances will be available in limited edition Mother’s Day gift boxes. Choose from Parks Original, Rose, Sandalwood & Ylang Ylang or Lime, Basil & Mandarin and one of two special keep-sake boxes. Each order comes with a free votive - providing even more scent and luxury this Mother’s Day. Your mum deserves to relax and feel pampered on Mother’s Day, and there’s no better way than by filling her home with a warm, indulgent scent. Our luxury 100% natural wax candles offer hours of captivating fragrance your mum will enjoy long after the usual Mother’s Day bouquet has wilted away. However you want to share your love this Mother’s Day, Parks has the perfect gift.